Back in October while we were camping with some friends, Philip, who was helping wash dishes, reached out to move the lantern. Unfortunately, he managed to catch the side of the lantern in his bid to grab the lantern, resulting in a minor, if painful, burn. My first thought, after making sure he was ok, was "why in the world didn't I think to bring a first aid kit?!" 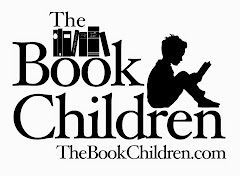 I had thought of everything else, long johns, wool hats, wool socks, plenty of food, extra wool blankets, and yet we had no first aid supplies save for a few bandaids squirreled away in my wallet. Almost as soon as we arrived home, I started looking for a first aid kit, thinking that it would be good to have one in the car anyway, when I quickly realized that I was unlikely to find a first aid kit with the types of aid I'd wish to have in a minor emergency. 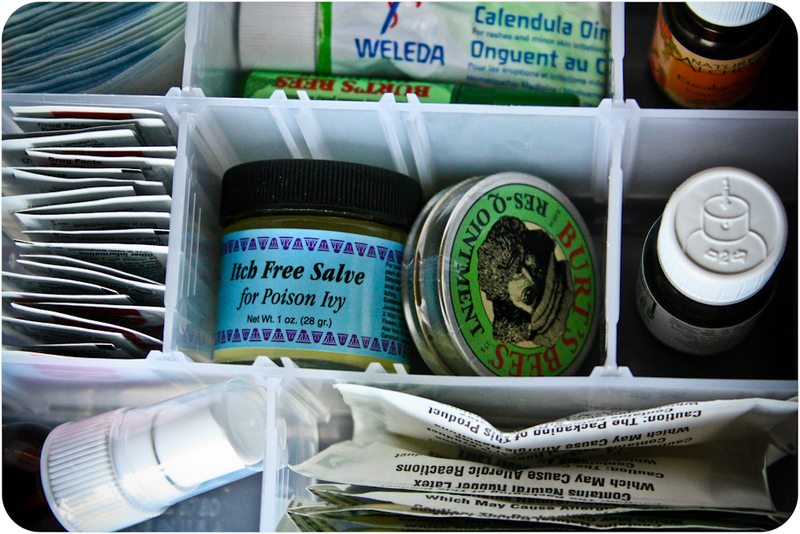 And so I started to make my own first aid kit. I started with a little organizer box that I found on Amazon. I wanted one that was deep enough to stand homeopathic bottles and small bottles of essential oils upright. My favorite feature about this box was the ability to adjust the size of the compartments with little sliding dividers. Some of the items that we use most frequently at home were added to the box, Umcka Cold Care for the onset of a cold, Valerian from Herbs for Kids for kids who are having trouble winding down to sleep, Arnica gel as well as Arnica pellets for minor bumps and bruises, Gripe Water for upset tummies. 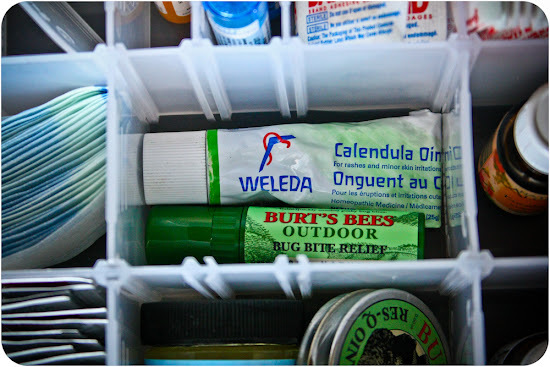 I also added Calendula Ointment for minor rashes and Burt's Bees bug bite relief for the inevitable insect bites. Poison ivy is my most dreaded fear (well, aside from bears) when we are camping, so I found a poison ivy salve to add to our kit as well as an herbal remedy for bumps and bruises by Burt's Bees. A colloidal silver throat spray, to kill any impending sore throats, is part of our home remedy collection so I included this too. I found a small container for Enzyme tablets to help any upset tummies that might occur from too many roasted marshmallows. 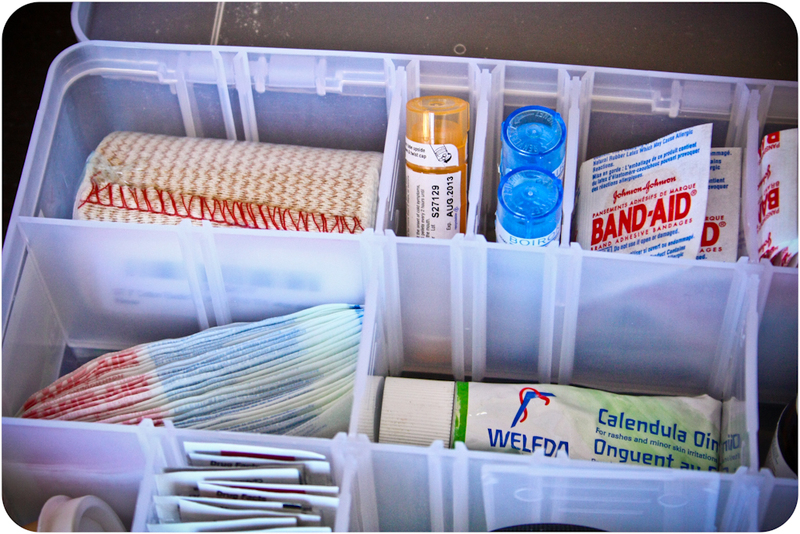 Along with various sizes of bandaids, gauze, and a length of elastic bandage, I feel like our kit is pretty well stocked with any needed supplies. The best thing about having this kit is that we now have one box to grab for a day trip or even a road trip, which means no loose bottles clinking around my toiletry bag when we travel. 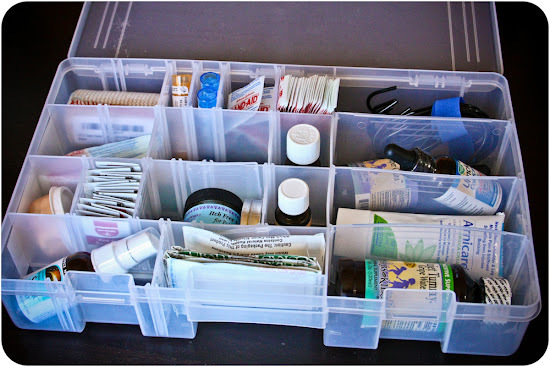 Have you made a similar kit for travel or even just home use? Is there anything that is a part of your kit that I'm missing? I'd love to hear your thoughts. Oh your poor guy! You know, this is something I really need to do, too. It's so good to be prepared for anything. 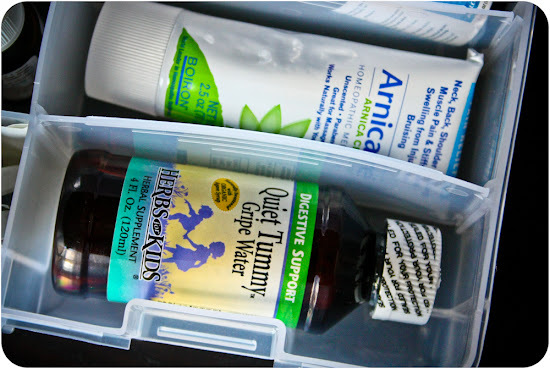 Nicole, I wouldn't give it to a kids who is actively vomiting, but the ginger, fennel, and peppermint (in this formula, at least) are great for upset tummies. 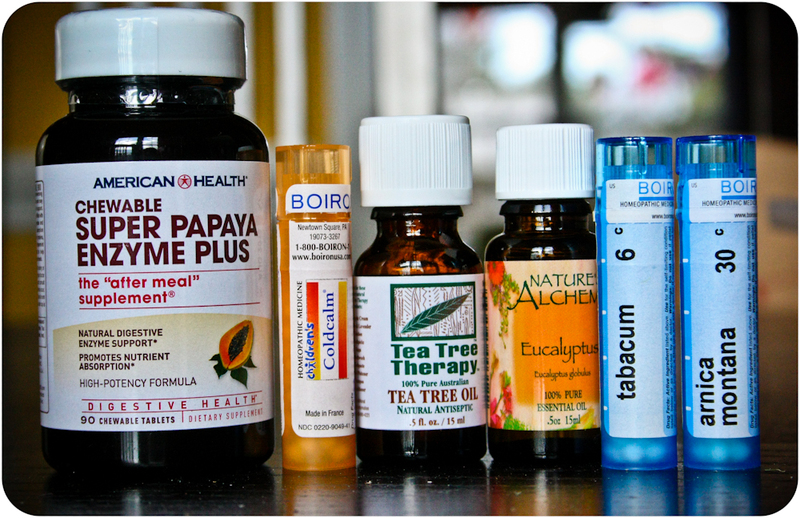 We use the enzymes more for the indigestion-type upset tummies. I'm debating getting a shelf-stable probiotic to add to this kit as well, although in general, I try to stay away from the shelf-stable varieties. This is much better than the red cross first aid kits we carry. Thanks for the idea. This appeals to my inner organizer so much! Love the tidiness and "completeness" of it! 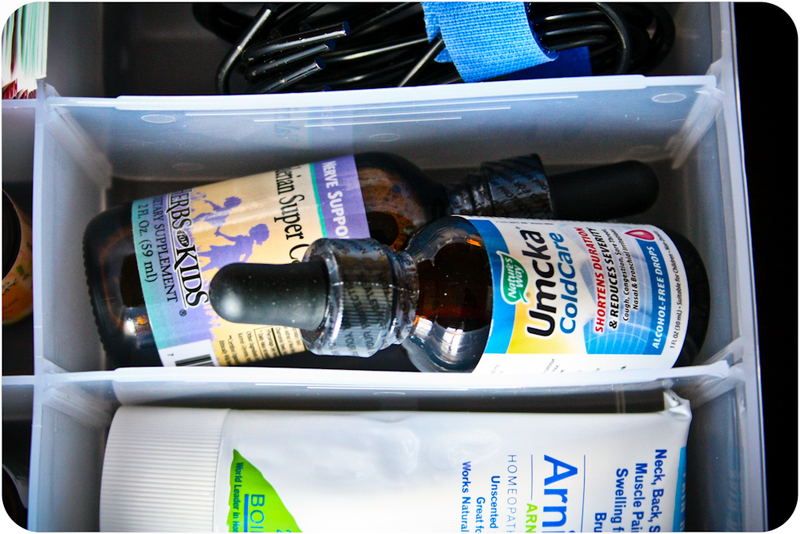 I may get booed here, but I never go camping without Tylenol, Gravol, and Benadryl. I was stung by a wasp last summer and Benadryl was the only thing that gave me comfort...I was so thankful it was me that got stung and not my kids! It's unlikely that my kids will get fevers while camping, but of course you know Murphy's Law: they only get sick at 10:00 on Saturday night when all (rural) pharmacies are closed! :) I keep certain things on hand in my cabinet...for example, worm medicine. I know, gross, but again...one of those things you don't want to discover at 10 on a Sat. night! Luckily we only needed it for that short stint when my girls were in daycare. Ugh. I'm going to pin this so I'll remember it for next summer! My kit also has rubber and latex gloves in it: latex disposables for clean hands to treat wounds or any other weird thing that comes up and thicker ones for splintery jobs. Its really look so different first aid kid and it will be more helpful in case of emergency. 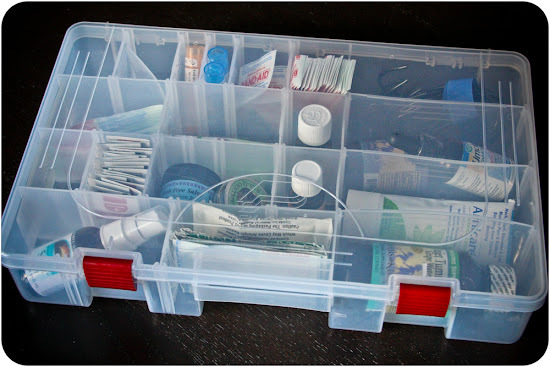 You also gives a nice idea to prepare a useful first aid kit for the readers. What a fantastic idea, in the car and close handy at all times, well done. Lavender oil will stop most insects from biting, is great on itches, and helps with good sleep.... a little goes a long way.